Users can insert this SD-to-CF media card adapter into a standard type II CompactFlash (CF) slot of a digital electronic device such as desktop or laptop computer, card reader, digital camera, PDA, printer, MP3 player and others; to read/write photo/data/music on Secure Digital (SD), Secure Digital High Capacity (SDHC) card, MultiMediaCard (MMC), miniSD*, microSD*, and Reduced Size MMC (RS-MMC) flash memory cards. Great companion product for digital SLR (DSLR) cameras accepting CompactFlash (CF) card. 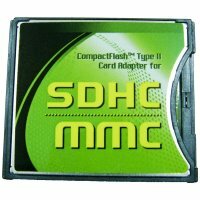 This memory card adapter works with Microsoft Windows 2000/XP//Vista/7 and Mac OS X10.3 or later. No driver is required for this memory card adapter. Please click here for card reader/writer (card drives).